MANILA, Philippines – When Senator Ralph Recto filed Senate Bill No. 2073 seeking to abolish Republic Act 10912, or the Continuing Professional Development (CPD) Law, majority of the local professionals rejoiced and became hopeful. But the clamor of the majority of the 3.2 million registered professionals to abolish CPD Law remains to be seen with the passing of Recto's bill. The question remains, how and when will the CPD Law be abolished? Is it really possible for the CPD Law to be abolished? Let's take a quick look at how laws are being repealed in the Philippines. The Republic Act 10912, or the Continuing Professional Development (CPD) is an act which requires registered professionals to earn a number of CPD units for the renewal of their Professional Identification Card. It is a requisite in ASEAN integration and to help make Filipino professionals become globally competitive. Why are professionals calling for the repeal of the CPD Law? What is the legislative procedure for the Senate Bill 2073 to become a law and formally repeal CPD Law? Now that the Senate Bill 2073 had been filed in the Senate, it will now have to be assigned to appropriate committees for debates and discussion. Depending on the presiding officer, the bill may be assigned to more than one committee. In the case of Senate bill 2073, it may fall under Senate committee on labor, employment, and human resources development with Senator Joel Villanueva as chairman. It can be recalled that Senator Joel Villanueva issued a statement that he strongly supports the amending of the CPD Law. He even went on to say that he will work in extending the validity of PRC license to up to 5 years. Another committee that possibly may hear the bill is the Committee on Civil Service, Government Reorganization and Professional Regulation with Senator Antonio Trillanes IV as chairman. Trillanes, the main author of the CPD law earlier expressed that he understands the sentiments against CPD but insists that it is necessary for professional development. 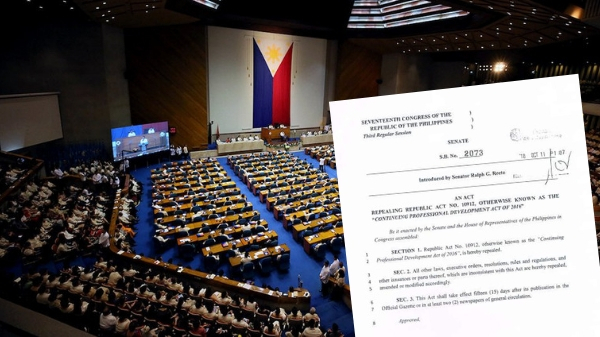 After the committee hearings and findings and suggestions are made, the bill will still have to pass the second and third readings before being submitted to the Lower chamber (House of Representatives). The Congress will look if they have a similar measure to the Senate bill and in this case, they do have. The House Bill No. 7171 submitted by Representatives Antonio Tinio and France Castro of the ACT Teachers Party-List also seeks to abolish CPD Law. The bicameral committee will now work together for alignment of the two versions. Once they come up with a version approved by both Houses, the final version will be printed and sent to Malacañang for the President’s signature turning it into a law. How long does a bill become a law? There is no definite time frame on how long a bill becomes a law since “Senate debate is unlimited unless cloture is invoked”. In the case of the CPD Law, it became a law on July 21, 2016 and took effect in less than one month on August 16, 2016. It’s implementation was not until a year after on March 15, 2017, upon the effectivity of Resolution No. 1032 or the Implementing Rules and Regulations (IRR) of R.A. No. 10912. If we are going to look into repealing an existing law, we can take an example on RA # 10655 or the repeal of the crime of premature marriage under RA 251. The timeframe for this begins on July 30, 2014 for the approval of Senate Bill but it took almost 5 months on December 17, 2014 until the House of Representatives approved their version. Then-President Benigno S. Aquino III approved it three more months after on March 13, 2015 to officially make it a law and repeal the existing law on premature marriage. What happened to House Bill No. 7171 by Representatives Antonio Tinio and France Castro of the ACT Teachers Party-List? The House Bill No. 717 filed by Representatives Antonio Tinio and France Castro of the ACT Teachers Party-List in the House of Representatives also seeks the abolition of the CPD Law back in February 2018.